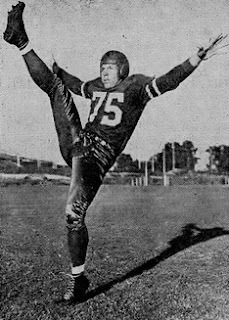 A stellar tackle and punter in college, Reinhard was chosen by the Chicago Cardinals in the fifth round of the 1942 NFL draft. He went into the military for the duration of World War II and in 1946 joined the Dons of the new AAFC. Reinhard started all 14 games and received consensus second-team All-AAFC honors. Reinhard remained with the Dons for the next two seasons and continued to excel as a tackle, if no longer handling punting duties, receiving consensus first-team All-AAFC recognition in 1948 and second-team honors in ’49. With the demise of the AAFC he moved on to the Los Angeles Rams of the NFL in 1950, his last season, in which he received second-team All-NFL recognition. For his three years as a punter with the Dons, Reinhard averaged 44.6 yards on 78 punts. Reinhard’s brother Bill also played for the Dons.